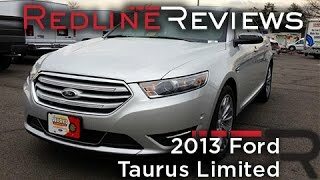 The sixth generation Ford Taurus has been around on the automotive market since 2010 but unfortunately year 2011 hasn't been a successful one for the Taurus judging by the sales figures. Apparently Ford agrees and took the Ford Taurus back to the drawing board in order to prepare a new face-lifted model offering higher performances, better looks and more equipment. First, let's have a look under the hood. 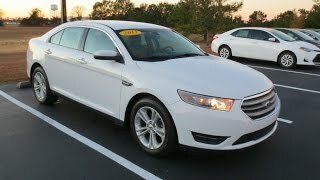 The Ford Taurus 2013 comes with two engine variants, the first one being a 2.0 liter EcoBoost engine that combines gasoline direct injection with a turbocharger. The EcoBoost engine develops 237 horsepower and 250 lb-fit of torque while offering a fuel efficiency of 31 mpg. The second, more powerful engine variant comes in the form of a 3.5 liter V6 engine boasting higher fuel efficiency than other V6 engines on the market. The 3.5 liter engine develops roughly 290 horsepower and will be enhanced by twin independent variable camshaft timing system (Ti-VCT) which supposedly delivers increased responsiveness, higher fuel efficiency and a reduction in part-throttle emissions. Both the 2.0 liter Ecoboost and 3.5 liter engines are paired with a six-speed automatic gearbox that features optimized gear selection and will help with lowering the fuel consumption. Other features designed to increase fuel efficiency are the low-tension front end accessory drive belt, reduced friction lubricants, aggressive deceleration fuel shutoff, smart battery management system and a variable-displacement air conditioning compressor. The Ford Taurus 2013 also benefits from torque vectoring control which applies a slight amount of braking force whenever the driver accelerates through a corner. This feature is usually found in high-ticket sports car and is meant to improve cornering and handling. 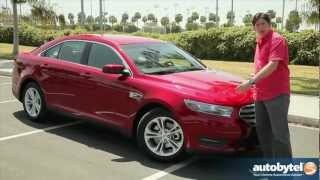 In addition the Ford Taurus 2013 also comes with curve control, another braking system which applies braking force on all four wheels whenever the system sensed that the driver enters a curve too quickly. Notable exterior modifications consist in narrower headlights, a wider front grille, LED taillights, new fenders and a redesigned trunk lid as well as a restyled hood. The interior enhancements of the Ford Taurus 2013 revolve around soft-touch materials on the center stack and dashboard, but mainly on an updated MyFord Touch system which replaces nobs and buttons with a multi-touch LCD screen that can be customized using voice commands. Other interior features include a new heated steering wheel, rear view camera, push-button start and Multicontour seats with Active Motion. 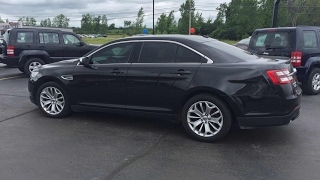 The 2013 Ford Taurus base model is to be sold at the MSRP of $26,600, which is not bad compared to the $32,000 Hyundai Azera 2012, the $30,200 luxurious Buick LaCrosse or the $27,200 2012 Chrysler 300.